Through these two course offerings, Ramtech will be able to provide an interactive learning environment to help architects grow their understanding of the vast potential that permanent modular construction can bring to their design offerings. Design-build commercial modular building firm Ramtech Building Systems of Mansfield, Texas has announced that the company has recently been approved as an American Institute of Architects (AIA) Continuing Education System provider. The company has begun offering face-to-face HSW Learning Units through its continuing education courses in Modular and Prefabricated Components. Ramtech's continuing education program will be available to AIA members located in the West South Central Region which includes the states of Texas, Oklahoma, Louisiana, and Arkansas. Ramtech will initially offer two courses focusing on every facet of design, manufacturing, and construction of commercial modular buildings. 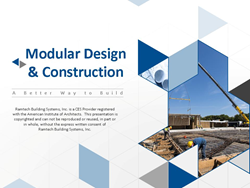 The first course, Modular Design & Construction – A Better Way to Build, is designed to educate the architectural community on the potential advantages gained through the use of permanent modular construction (PMC) for all project stakeholders. The second course will provide a plant tour and walking class of Ramtech's manufacturing facility to provide instruction on material methods and management, sustainable methods of construction, methods of centralized construction for ICC Building Code compliance, and walk-thrus of finished buildings. According to Gary Davenport, Ramtech's Architect and Design Project Manager, “Through these two course offerings, we'll be able to provide an interactive learning environment to help architects grow their understanding of the vast potential that permanent modular construction can bring to their design offerings.” Each course will provide one HSW unit that can be applied towards meeting the 18 continuing education learning units that architects are required to have each year for their license renewal. Since 1982 Ramtech Building Systems has been providing innovative relocatable and permanent modular buildings for commercial companies, educational institutions, government agencies, and healthcare providers throughout the Southern United States. As a vertically integrated design-build construction company, Ramtech provides full in-house design, a manufacturer direct product, and complete site construction services all within a single-source solution. Ramtech can offer facilities built using permanent modular construction on both a pier and beam or concrete slab foundation. Both options combine the best of off-site manufacturing and on-site construction techniques in order to produce a building faster and with less cost, but identical in the look, functionality, and life expectancy of a completely site-built structure. By emphasizing a value engineering approach, Ramtech has successfully completed over 4,000 diverse projects of all sizes. For more information, visit the company's website at RamtechModular.com.